I have always enjoyed reading Geisler, and most of us have read him for years in the field of apologetics and philosophy. Here, Geisler speaks to the current issues of “Extreme Arminianism” (seen in the elimination of God’s sovereignty) and “Extreme Calvinism” (seen in the elimination of Man’s free will). Geisler takes issue with Extreme Arminians such as Pinnock, Boyd, Rice and others, and with Extreme Calvinists such as Sproul, Piper and often back to J. Edwards. 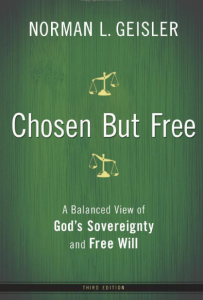 Geisler considers himself a “Moderate Calvinist, as opposed to a “Moderate Arminian” due to eternal security.